In a few days we'll be heading into Cambodia and beginning our volunteer stint at WLS in Siem Reap. Our time will be split between teaching at SOID (School for Poor Children) in the morning and working at the orphanage in the afternoon. Of the 23 children at the orphanage, ranging from 5 to 17 years of age, about 10 of them are blind or visually impaired. They are joined by another 180 children for English lessons throughout the day. Without volunteers, there is just one teacher to teach all 200 children in 6 classes a day. We're looking forward to pitching in and helping out whereever needed. First of all, thank you so much to everyone who has contributed. Because of the kindness of friends (and a few strangers!) 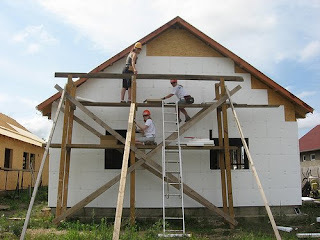 our fees for the Habitat for Humanity work in Hungary were covered, as were our fees for our work with WLS in Cambodia. $1000 went directly to the HFH chapter in Hungary, and a large portion of our WLS fees will go directly to the programs being run in Siem Reap. We are still gratiously accepting donations to help cover the costs of the rest of our volunteer projects. 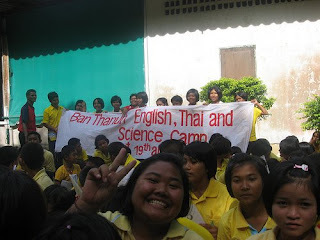 Our work in Khao Lak Thailand cost a total of $760, which includes a $200 donation to Volunteer Teacher Thailand . Look closely and you'll find us on the website! Our work in Belize, Costa Rica and New Orleans will cost approximately $1600. None of this includes the fees for flights. So...if you or anyone you know is willing to contribute to the cause, please click on the paypal link and donate away! We sincerely appreciate it. We can guarantee that your donation is being put to good use. In both Hungary and Thailand, necessary supplies were few and far between. Even a small donation made a big difference- the HFH chapter in Hungary bought a new, much needed, circular saw. Volunteer Teacher Thailand was able to buy materials like laminating paper, pens and paper to help develop more lessons for the students. Beyond the monetary donations, we continue to develop connections with people where we volunteer and hope to continue to work with these groups in some way in the future. In our free time, we're often brainstorming ways that we can continue to assist these worthy organizations and stay in contact with the amazing people we've met. Unfortunately, our internet time is fairly limited, because we have hundreds of stories about the people we've met and the work we've done. We'll try to keep you updated as much as possible!